General Chart of Delaware and Chesapeake Bays and the Sea Coast from Cape May to Cape Henry. 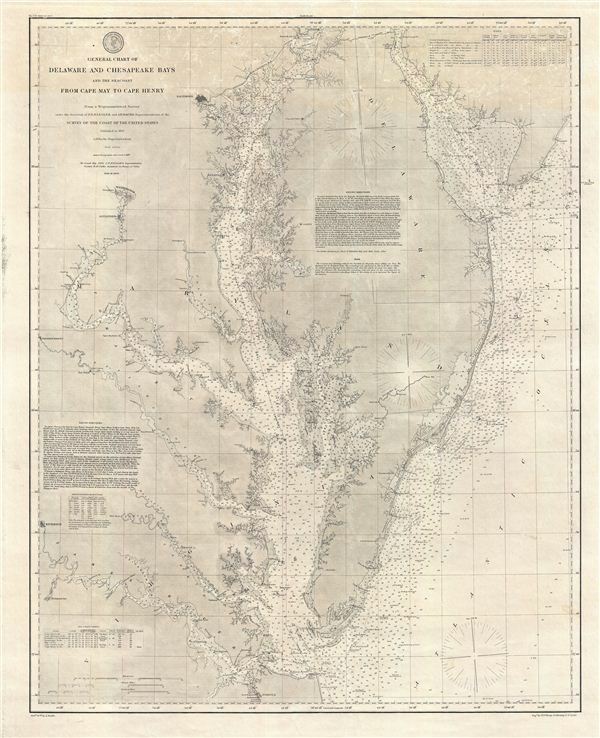 An extraordinary 1882 U.S. Coast Survey nautical chart or maritime map of the Chesapeake Bay and Delaware Bay. This is one of the rarest and most desirable charts issued by the U.S. Coast Survey. Centered in the Chesapeake Bay this ma covers from Norfolk Virginia and Cape Henry north to Cape Map and Charlestown. The map includes the cities of Washington D.C., Baltimore, Richmond, Fredericksburg and Petersburg, among lesser centers. While this map offers only minimal inland detail, the maritime detail is extraordinary. Offers thousands of depth soundingx throughout and identifies various important bays, sounds, islands, shoals and other undersea dangers, lighthouses, beacons, rivers, etc. Detailed sailing instructions for the Chesapeake Bay appear in the lower left quadrant. Sailing instructions for the Delaware Bay appear in the upper right. Notes on lighthouses in the lower left quadrant and on tides in the upper right.